space scienceScientists have launched a months-long global observation campaign of an asteroid, to help pave the way for an ambitious NASA sample-return mission to the space rock. Every six years, the asteroid 1999 RQ36 makes a relatively close pass to Earth and there's even a remote chance it could pose a threat to Earth when it swings near our planet in 2182. The space rock is right in the middle of its latest close approach now, so astronomers are training a variety of instruments on it. This viewing window affords the last good look they can get at 1999 RQ36 from the ground before NASA's Osiris-Rex mission launches toward the asteroid in 2016, researchers said. The $800 million Osiris-Rex mission — its name is short for Origins-Spectral Interpretation-Resource Identification-Security-Regolith Explorer — should arrive at 1999 RQ36 in 2020 and return some samples of the asteroid to Earth by 2023. 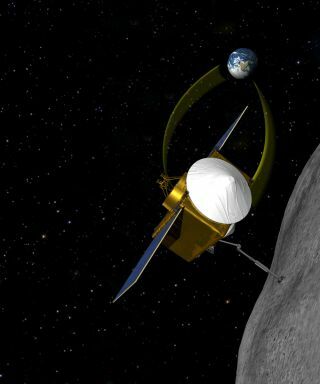 Osiris-Rex will be the United States' first asteroid sample-return effort and only the second mission in history to retrieve samples from an asteroid. Japan's Hayabusa spacecraft successfully returned tiny grains of the asteroid Itokawa to Earth in June 2010. Researchers will study the bits of 1999 RQ36 for clues about the solar system's origin and, possibly, how life may have begun on our planet. Many scientists suspect an asteroid seeded Earth with life's building blocks eons ago, and 1999 RQ36 looks to be packed full of just such carbon-based molecules. Specifically, Osiris-Rex should allow scientists to measure the "Yarkovsky effect" for the first time, researchers said. This phenomenon is the tiny push the sun gives an asteroid, as it absorbs sunlight and re-emits that energy as heat. The small push adds up over time, but it's tough to predict in detail because asteroids' shapes, compositions and rotations can vary so much. "We lucked out in that not only is this an asteroid that's relatively easy to get to, it is extremely interesting, exactly the kind of object that we want for this mission," said Carl Hergenrother of the University of Arizona, who heads the Osiris-Rex asteroid astronomy working group, in a statement. 1999 RQ36's closest approach to Earth during this latest pass occurred in early September, when it came within 3.1 million miles (5 million kilometers), researchers said. That's close, but the asteroid has come closer. In 1999, for example, it passed within 1.4 million miles (2.3 million km) of our planet. An international team of astronomers is taking advantage of 1999 RQ36's current proximity. Researchers have time, or are applying for time, on a network of telescopes operating in Arizona, the Canary Islands, Chile, Puerto Rico and space, researchers said. They plan to observe through spring 2012. Researchers hope to learn as much as possible about the asteroid before Osiris-Rex's 2016 launch. The observations should help the team plan out the mission's finer points and check some of the data the spacecraft gathers from orbit around 1999 RQ36.